Perhaps there isn’t any greater religious hubris than the Christian who thinks himself, his church, and the fellowship of churches that his church is affiliated with to be the only Christians. Yet this sectarian mindset is the thinking of some, perhaps many, in the fellowship known as the Churches of Christ. But it certainly is not the thinking of every Church of Christ and thankfully so! On the Christian Chronicle is an article titled “How Then Should We Interact?” The article discusses how some Churches of Christ are interacting with other local churches for the sake of God’s glory and mission. Of course there are still other Churches of Christ and members of the Churches of Christ who wish to remain in isolation, having nothing to do with other churches. But I am so glad that this sectarianism is dying among us, even if it is a slow process. Let it die! Reading through the article and the comments by those among the Churches of Christ who are opposed to any interaction with other churches, I sense that the main reason for such opposition is a belief that we who call ourselves the Churches of Christ already know the complete truth of God’s word. This “we have all the truth” mentality is the root of this sectarian hubris. Not one church knows it all… not any Church of Christ nor any other church. We all know something, but not everything. For this reason, let me clearly say that if you are a member of a Church of Christ, you have everything to gain from interacting with Christians from other churches. If you are a minister of a Church of Christ, you have everything to gain from interacting with other ministers from other churches. Just last week I attended a lunch with about fifteen other ministers from churches in Columbia and besides eating, we spent time praying and listening to a Messianic Jew share with us how he became a follower of Jesus and how we might win other Jewish people to faith in Jesus the Messiah. This week I am attending a D.Min class at Northern Seminary with ministers from various churches and we are all helping each other learn how we can better lead our own churches as followers of Jesus. Churches of Christ… the beauty of interacting with other churches is that we need them and they need us. As more and more churches become smaller, as the American culture becomes more and more secular and post-Christian, and as more and more people suffer and grow up as unbelievers… we need them and they need us. As individual Christians, we need fellowship with those other Christians and they need fellowship with us. We never know when we might find ourselves struggling or find one of them struggling. Beyond this, not one of us knows all the truth and we might just teach each other a better understanding of God’s will if with the humility of Jesus, we’ll receive each other as a gift from God. Some will object, suggesting that any interaction with other churches will just weaken or confuse our understanding of the Christian faith, the Bible, etc… That’s ironic since they don’t have any actual way of knowing that unless they are willing to interact with other Christians. Nevertheless, I am telling you that such a claim is bogus. My understanding of who God is, the life Jesus calls us to follow him in living, the Holy Spirit, doctrines such as baptism and the Lord’s Supper, and so on, have only become more robust as I learn from Christians of other churches. I am still able to say when I believe they have misunderstood the Bible at some point but I have also seen where I too have misunderstood the Bible. So how about a little more humility so that we may receive God’s blessing of our fellow Christians in those other churches. May God be glorified as we embrace what Christ has already made every believer… One! This entry was posted in Churches of Christ, Columbia Church of Christ, Faith. Bookmark the permalink. Great article Rex, thanks for the insight and the willingness to fellowship with Christians who may differ on Sunday practices. Having done so myself it does truly enhance and grow our own belief. Wondering, do you think if churches were to do more of this sort of thing that it would be a testimony to the world at our resolve? seems there could be ways of interacting among churches, not just with Pastors and Ministers. If you have any ideas how churches could go about such things or where to start, that could make for an interesting article. I do think that it would be a witness to Jesus Christ if more Christians/churches of different fellowships would interact together. I have seen this done where several other local churches supported a Youth Coffee House Ministry ran by a local Church of Christ while this Church of Christ and several other local churches supported another local church’s ministry to unwed mothers. That is one way that churches can interact for the sake of ministry. But I would also say that we could be joining together for prayer and reading of scripture as an encouragement to one another as sort of a small group in our work spaces, social spaces,etc… I know a Christian who is a member of a Church of Christ that meets with several other Christians from different churches in their office to pray for each other and what goes on in their office. Good piece of article, I have not read the original from the Christian Chronicle as I don’t reside in the US. Of course we need to interact with people from all shades and views of opinions. However,the central question is what is the essence or purpose of such interaction ? Is it social or religious, whichever purpose it is, it must have a reason or an objective, so as to make it meaningful and beneficial. Social interactions surely create the path which leads to other interactions ( business, scholarly, religious etc). At the inception of the Restoration Movement, it is evident that it is these interactions ( social and religious) that brought together the pioneers from their hitherto individual closets to discuss and agree on principles that brought about what we have today. Am not am American, but I expect brethren to know their heritage and to appreciate how the church of Christ as presently constituted came about . It is because we don’t teach these anymore that has brought us to this state! We set out to restore, how can this be accomplished if we don’t interact with others thus making our views and positions known to them? To me it is people who are not sure of what they believe, who are afraid to come into contact with others. If you know what you believe and why you believe them, you can hold your grounds even in the midst diverse views! Interacting with others from diverse positions, will enrich your understanding of them and where they are coming from. You will be well prepared to share/ teach them your faith. Your article should be a wake up call to all, that if we want to make an impact on the world and Br veg as many to the saving knowledge of Christ , we must engaged them . It is with humility that I submit these views and position. I read the original article, and some of the comments were tragic. Someone even said the joint service was sinful. Now, that is awful. When Christianity starts fighting itself then those opposed to Christianity win without having to do anything. 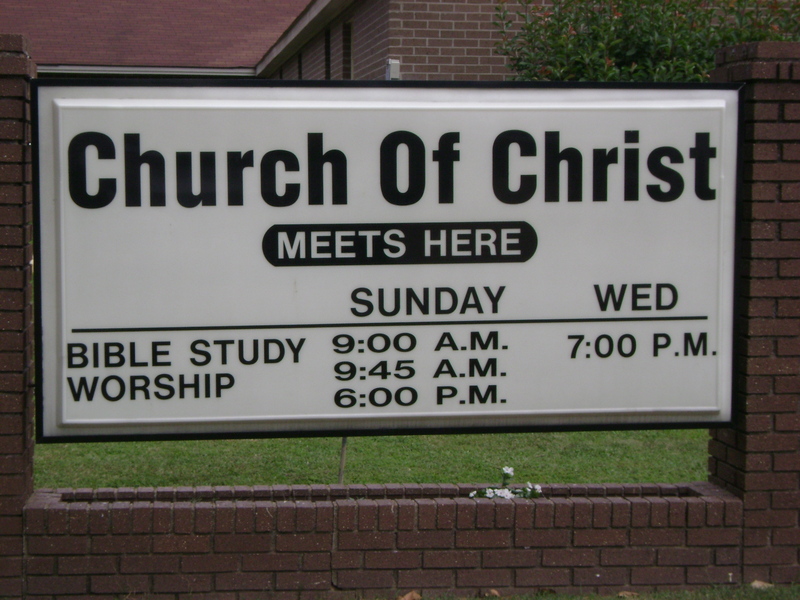 The article states “we in Churches of Christ want to draw rigid lines of exclusion and impose boundaries that Scripture does not impose.” Sadly, I have seen those lines of exclusion drawn down the aisles of the cofC sanctuary. I have been to one of these joint services, which was held in a university chapel. The pipe organ was played as one group was in charge of music, the cofC minister preached a good sermon (as it was his turn) and he did NOT compromise anything. The catholic priest was there to lead the creed as were many other clergy. The service was quite nice. Wow! I would have liked to be at that worship gathering. It sounds very encouraging and glorifying to God. How wonderful it is to be inclusive. All one has to do is ask the simple question, How many “churches” did Christ build? How many “churches” did Christ die for? In Eph 4, we see that there is but one faith, one body etc. We have been instructed by inspired writers on how that church worships, what it is to believe and what it is to teach. Why would I want to join a group who doesn’t do that? What fellowship has righteousness with lawlessness? What communion has light with darkness? I nor you have the authority or right to change what the Lord has made. yet that’s exactly what you advise. We must change and conform to what the Lord wants, you desire to change what the Lord wants into what you want. The mere fact that you join and share in vain worship is to share in their evil deeds, as it is written. God does not accept vain worship, He only accepts what He has authorized. Just who are those people spoken of in Matt 7:21f? They are people who thought they were following Christ, worshipping acceptably, but what did Christ say?There will come a day when men who have itching ears, who will set before themselves men, who teach the doctrines of men. Please tell me how worshipping with other Christians is “vain worship”. Jeff, as I suggested at the beginning of the post, there isn’t any greater religious hubris than the Christian who thinks himself, his church, and the fellowship of churches that his church is affiliated with as the sum total of the body of Christ. Maybe it is you who has the itching ears, who only wants to hear from the men who will teach the sectarian doctrine of men! Typical liberal stance, silence those who oppose you, instead of having a robust debate. Or is it God’s word that has you silenced? No Jeff, I am more than willing to discuss matters — which I done with you in the past — but arguing, which is what you want to constantly engage in, I am unwilling to do (cf. Titus 3:9). If you want to put forth a different view, making inflammatory and accusatory remarks (e.g., “liberalism), then do so on your own blog. For now, your getting blocked (something I’ve only done with one other person in my eight years of blogging). I feel honored Rex. You call it arguing I call it contending for the truth. I will only put forth a biblical view. Your view I do not share. After reading Jeff’s comments, in particular his first sentence, “How wonderful it is to be inclusive”, all I can do is shake my head and think to myself, “No wonder people, young people especially, are leaving the CoC in droves”. No doubt, churches that think like him will remain and continue to be a shrill voice in certain parts of the country. They will keep their religion, their politics and their culture all stirred and cooked up as a “Mulligan Stew” that is served up on Sundays and Wednesdays, while the other days are spent rationalizing their secretive conduct, conduct they refuse to show any mercy toward in others who are not in the “Lord’s church”. Some words show us that it becomes a complete waste of heart and mind to remain allied with their source. Unfortunately, much of the progressive Church of Christ today has kept a political and cultural tie to such, believing to do so is better than a radical turn. But when we listen to such words it should make us realize that the CoC has a lot of ground to make up when it comes to mercy and compassion. The goal should be to reach that level of maturity in which there is no longer the fear that the preaching of mercy and compassion will cause people to think they can live just any way and do just anything they want. When mercy and compassion are trusted in one another’s heart then people will humbly sing the scripture, “When I was a child, I spoke like a child, I thought like a child, I reasoned like a child; when I became an adult I put an end to childish ways”, while not fearing the childish who choose to walk away. If I had a “like” button for your comment, I would hit it.